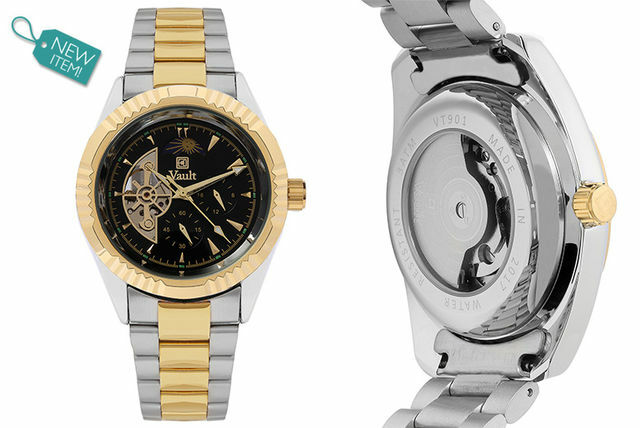 Get yourself a suave and sophisticated new timepiece with this gorgeous men’s watch. Featuring a classic two-tone metal strap, black dials and two subdials, this stylish accessory is just the thing for all occasions, whether for work, going out for dinner, special occasions or more formal events. Get a Vault men’s watch. Gorgeous black dial, two subdials and a two-tone metal strap. Classic design with a unique, modern twist. Skeleton design displays the watch’s complex inner workings. Water resistant and made from durable, high-quality stainless steel, this watch would make the perfect gift for a fashion-conscious gentleman. So hurry and redeem before time runs out on this deal! Upgrade your wrist wear with this stunning watch! Perfect for a special occasion or to just show off while you’re out and about, this stunning timepiece will be certain to turn heads. Upgrade your wrist wear with a men’s Vault two-tone watch! 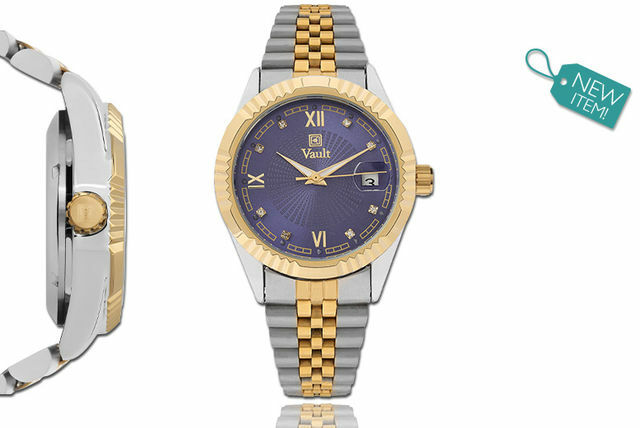 Classy blue dial with sparkling crystals and gold-coloured markers. Made with high-quality stainless steel and solid mineral glass. 3ATM water-resistant to a depth of 96 metres. With a classy blue dial made with sparkling crystals and gold-coloured markers you’ll feel like you’re looking into a deep night sky every time you check the time. Made with high-quality stainless steel and solid mineral glass, your watch is sure to stand the test of time and is even 3ATM water-resistant to a depth of 96m. Vault are you waiting for? !